Meet Olaplex - the new hair color additive that is changing the color industry for salon professionals and color junkies alike. 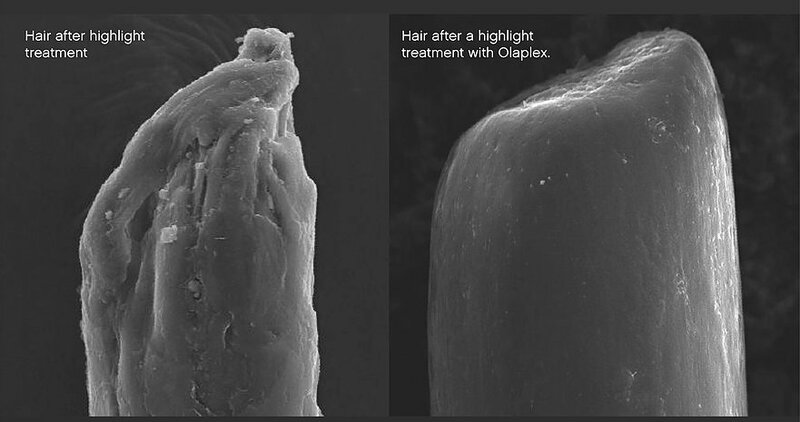 Olaplex utilizes a new chemistry that is truly revolutionary. During the coloring and lightening process, hair color penetrates the hair shaft at the cellular level, chemically altering the bond structure of the strand, weakening the hair's natural integrity and strength. Traditionally, this meant having to space out color and lightening services to allow the hair to heal in between. Results were often limited by the health of the hair and how much more chemical damage it could handle. Olaplex has changed this forever, allowing stylists to use color and lightener in new ways, pushing the boundaries further than ever before possible. At a cellular level, when hair is damaged, its hydrogen and sulphide bonds are separated, weakening its structural integrity. Breakage in the bonds occurs primarily when hair is exposed to the chemicals in color and lighteners, but also from exposure to heat from blow dryers and irons and from the mechanical damage that can occur from combing and brushing. Olaplex reconnects the sulphide bonds, leaving your hair softer, shinier, and easier to manage with less frizz. Utilizing polymers (the same compound used in transplant surgery to prevent rejection) Olaplex maintains the bond structure throughout the color and lightening process, leaving strands in their natural state from start to finish. The restorative effects of Olaplex last because the results are based upon strengthened natural bonds within the hair shaft itself. It isn’t just a coating or a conditioner – it fundamentally changes the chemical composition of your hair. Because the hair is healthier and stronger, color bonds to each strand more completely, offering longer-lasting and more vibrant results. Deep chocolate brown hair for winter, sun kissed highlights for summer, it’s no secret we love to switch things up from season to season, but truth be told, it can take a toll on your hair. While we love being versatile with the styles and colors we provide for our clients, without the proper products and care, color treated hair has a much higher tendency to become damaged over time, and that’s why we’ve fallen in love with Olaplex.